The museum is located in the former 1870 customs building. 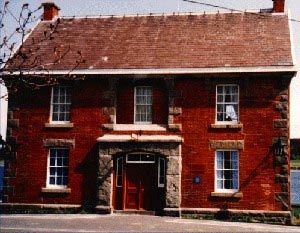 The first floor consists of exhibits showcasing the inshore Conception Bay fishery from the nineteenth and twentieth centuries, complete with fishery implements and tools, and an exhibit concerning the Peter Easton, a seventeenth century pirate who was based out of this area. Located on the second floor, is an extensive aviation exhibit, complete with aircraft models and photos of famous aviators who visited the community including Amelia Earhart, Wiley Post, and Charles Lindburgh. The exhibit also includes a selection of aircraft equipment such as a flare gun, and a log book, which was used on trans-Atlantic flights. The floor also has a period-setting room, housing various furniture pieces from the Presentation Convent of 1853. On the third floor, photographs depicting the history of Harbour Grace, including photos of the Water Street fires of the late nineteenth century and 1944. Occupational tools and implements are also displayed relating to coopering, carpentry, fishery, mercantile, sealing and whaling. In addition, vintage broadcasting equipment used in the community are displayed. Domestic themes are also represented, including various wedding dresses from the mid 19th and early 20th centuries.